VetkinTape® veterinary tape is an elastic kinesiology tape, developed and innovated especially for the veterinary application. VetkinTape® (3cm, 6cm and 10cm) has a number of key features; a special adhesive layer designed to stick on animal coats, 145% stretch to match the many and varied sizes of animals where application is required, primarily the equine and canine sector. 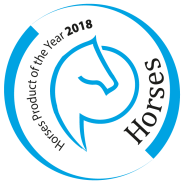 VetkinTape® veterinary tape has been nominated for “Horses Product of the year 2018”.